It's an easy sweet treat this week for the Friday Food Craft. This recipe can actually be switched up to become almost any flavor you would like. It's a great fudge recipe because it doesn't require any candy thermometer and hassle. Just a few easy ingredients and about 15 minutes of your time and you can have delicious fudge. Also, you can leave out the artificial food coloring if you like. This fudge comes together very quickly, so you will want to have a helper to stir while you add all of your ingredients, or make sure you have everything measured out before you begin and close at hand. Also, make you sure you have greased your baking dish ahead of time. In a large saucepan, heat the evaporated milk, sugar and butter until bubbling, then continue to cook for 4 minutes while stirring continuously. 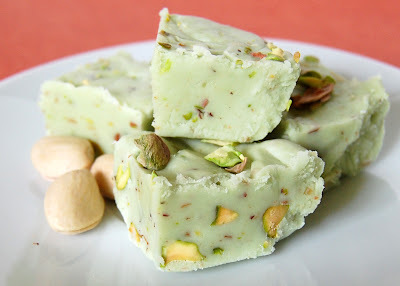 Remove from heat and add your white chocolate chips, marshmallow creme, vanilla, salt, pistachios and food coloring. You may add more or less green coloring depending how green you want your fudge. Fill your prepared baking dish, smooth out the top and let cool. You may add extra pistachios on top if you wish. This recipe is really easy, and to change your flavors just substitute out what type of nuts (if any) and the flavor of chocolate chips you use instead of white chocolate chips (I have used soft peppermint sticks around the holidays to make a great peppermint fudge, you could also use butterscotch, peanut butter chips, mint and dark chocolate). I'm a big fan of pistachios, and they sound great with white chocolate in fudge! This looks fantastic! I love pistachios, I will bookmark this and it will definitely make it into my Christmas baskets this year. Never done fudge before. Looks tasty. What a delicious dessert! Thanks for sharing! 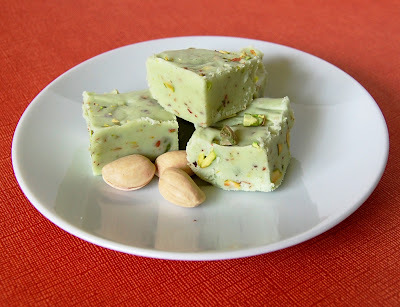 I have never seen pistachio fudge. I love pistachios though. This looks heavenly! Oh wow! That is an interesting piece of fudge... yummo! I love pistachios...I can only imagine just how good this was with the white chocolate and marshmallow creme! It's looks delicious. Never done it before. This is the best thing ever. Unless you count impact on my waistline, then I guess it's the worst thing ever. I'll deal with it. This looks so amazing. Pistachios are my fave thing in the world. Cannot wait to try this out. Wow It's looks delicious thanks for sharing it! Has anyone made this? I just did and wondered how long it took to set up? I put mine in the refrigerator and it sets up in about 30 minutes to an hour, depending on pan size and how thick the fudge is.